People often think of eye health as something largely out of their control. We know to brush and floss to keep our teeth in tip-top shape, and to eat right and work in some cardio time at the gym for our heart's sake, but what about our peepers? The truth is, whether we know it or not, there are actually lots of steps we can take to help our eyes stay healthy and our vision clear. So no more excuses, it's time to get smart about eye health now so we don't end up saying "eye, ay, ay" down the road when vision problems develop. Armed with a little knowledge, taking care of those baby blues — or browns or greens — can be as routine and easy as taking care of our smiles. 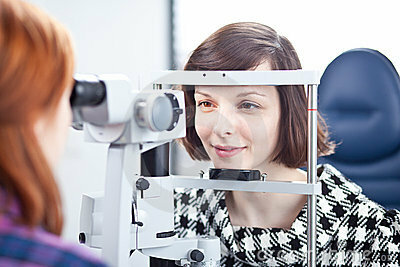 One of the most important aspects of eye health is attending regular eye doctor appointments. "You might think your vision is fine or that your eyes are healthy, but visiting your eye care professional for a comprehensive dilated eye exam is the only way to really be sure," writes the National Eye Institute (NEI). "Many common eye diseases such as glaucoma, diabetic eye disease and age-related macular degeneration often have no warning signs. A dilated eye exam is the only way to detect these diseases in their early stages," says the NEI. During these exams, eye drops are used to make the pupils dilate (widen). This allows more light into the eyes so the doctor can thoroughly examine the backs of the eyes. Prevent Blindness America (PBA), a volunteer eye health and safety organization, recommends different frequencies of comprehensive dilated eye exams for people in various age groups and ethnicities, due to differences in risk factors. According to PBA, African Americans aged 20 to 39 should get an exam every two to four years, and Caucasians in the same age group should get an exam every three to five years. Both African Americans and Caucasians aged 40 to 64 should get an exam every two to four years, and everyone aged 65 and older should get an exam every one to two years. PBA notes, however, that people with special risk factors may need to visit their doctor for an exam more frequently. This includes people with previous eye troubles, diabetes or a family history of glaucoma. Furthermore, PBA stresses, "People with symptoms of eye trouble should see an eye doctor right away." In an interview with dailyRx News, Christopher Quinn, OD, FAAO, of the Robert Wood Johnson University Hospital in New Jersey, also highlighted the importance of regular eye exams to overall health. "The eyes are a window to the body. It is the only place doctors can directly observe nerves and blood vessels and assess their health," Dr. Quinn explained. "Not only do regular eye exams detect eye problems but regular annual eye exams can alert patients to treatable health problems like hypertension and diabetes," said Dr. Quinn. According to PBA, overexposure to the sun's UV rays can lead to a variety of eye problems over time, including macular degeneration (a leading cause of blindness in older adults), cataracts and skin cancer of the eyelids. Potential problems from too much sun aren't necessarily far off in the future. PBA reports that high short-term exposure to UV-B rays — like you may experience during a long day on the slopes or at the shore without eye protection — can cause a corneal sunburn. This painful condition can sometimes lead to temporary vision loss. To protect your eyes from sun damage, there's no need to hide inside. Simple steps like wearing hats and sunglasses can help keep you safe. According to PBA, "A wide brimmed hat or cap will block about half of UV rays...," as well as blocking some additional rays that may sneak in around glasses. When it comes to choosing sunglasses, the organization recommends finding a pair that filter out 99 to 100 percent of UV rays (it is important to read the labels closely), reduce glare, are comfortable to wear and do not distort the colors you see. It turns out that eating for eye health really isn't all that complicated. According to EyeSmart, a public awareness campaign from the American Academy of Ophthalmology, the same type of diet that is good for your heart (i.e., lots of vegetables, fruits and whole grains, and easy on the fat) is likely great for your eyes as well. "[Y]our eyes rely on tiny arteries for oxygen and nutrients, just as the heart relies on much larger arteries. Keeping those arteries healthy will help your eyes," explains the organization. EyeSmart does recommend several specific foods that are known to be especially helpful to the health of your eyes: kale, salmon, oranges and black-eyed peas. "Leafy green vegetables, like kale, are high in lutein and zeaxanthin, two nutrients found in the healthy eye that are believed to lower your risk for age-related macular degeneration and cataracts," reports EyeSmart. Salmon makes the list due to its levels of omega-3 fatty acid — a nutrient that some studies have tied to a lower risk of age-related eye problems. Oranges (and all citrus) are important because of their high vitamin C content. "Scientists have found that your eyes need relatively high levels of vitamin C to function properly, and antioxidants can prevent or at least delay cataracts and [age-related macular degeneration]," explains EyeSmart. And black-eyed peas get a mention because those legumes contain zinc. According to EyeSmart, there is a high concentration of this trace mineral in the eyes, and it might help protect your eyes from damage caused by light. By taking simple steps with eye health in mind, you can help lower the risk of developing vision problems. One more final step that often gets overlooked? Wearing protective eyewear. According to the Louisiana Ophthalmology Association, between 1.6 and 2.4 million people sustain eye injuries each year in the US, around 40,000 of whom will be legally blinded in the injured eye. In order to prevent such events, the NEI recommends that people wear strong, polycarbonate, protective eyewear when necessary. "Wear protective eyewear when playing sports or doing activities around the home. Protective eyewear includes safety glasses and goggles, safety shields and eye guards specially designed to provide the correct protection for a certain activity," says the NEI. Basic actions like wearing protective eyewear, having routine eye exams, protecting the eyes from the sun and eating right allow you to play a more active role in the health of your eyes. With just a little commitment and effort, you can take part in protecting your peepers and not just leave eye health up to fate.